Like Mark Levinson, Vinnie Rossi the man has become Vinnie Rossi the brand. Those familiar with his work at Red Wine Audio will get this most recent development even if all I say is "beyond and better than batteries, fully modular, customer direct". In the man's own words, "attached is what I'll be handing out at the NY Show this weekend as the front and back sides of the brochure. Going much deeper, I attached a word doc of some of the content that will be on the new website soon. It explains a lot and builds on what I told you about in our correspondence last month. But it probably does not complete the big picture yet. I only have a prototype at this time and 3D renderings. The formal product photo shoot will follow next month when we receive the final production parts. My goal is to be in production by November 2014. The first few units will be reserved for reviewers and I'd be honoured to send you one loaded in the finish you want and with the exact features you want (as though you were a customer ordering a custom configuration from our website which will be live in time for RMAF just a couple of weeks away)." Let's take a look..
For a quick hit of the highlights, the brochure's backside lists the core assets. For a bigger view of one fully duded-up maxed-out version, this tells the tale. From Vinnie Rossi the brand's first blog entry: "If you are reading this, then I am excited to report that we have officially launched the new Vinnie Rossi website. And you probably have already seen our upcoming LIO system that will become a true game changer for our customers! This website was designed to offer a high level of interaction with our customers. It features a blog section (where you found this first blog post and will find many more to come), a dedicated user forum, links to our social media pages on Facebook, Twitter, Google+ etc, a section where you can write testimonials and upload them to this site, a link to join our newsletter and even a place to type an email to us directly from this site. All of this will bring you the latest Vinnie Rossi information and allow you to join our community of users who deeply enjoy learning from each other, sharing their experiences, discussing what they would like to see next etc. This level of customer interaction will be unmatched and we want you to get the most from it! No matter what your age is, what genres of music you like, whether you prefer vinyl or digital or what your headphone/speaker preference is – you will know that you are in the right place if you are here to have fun and enjoy this hobby - and most importantly, acquire a deeper connection to your music in the process. Welcome and thank you for being a part of this!" For the full treatment, there's this: "Some of you already know me from Red Wine Audio which I founded late 2004. I am an electrical engineer with a passion for designing audio equipment that emotionally pulls the listener deep into the music. I believe in handcrafting my designs in the USA and backing them up with a 5-year warranty and industry-leading customer service. I embrace a less-is-more approach using purist circuit topologies that eschew high parts count in favour of elegant simplicity; and using the highest quality components throughout. I'm fanatical about utilizing isolated ultra-low impedance power supply design as a necessity to achieve the finest sonic results. I established Red Wine as the leader in high-fidelity battery-powered audio components that have earned numerous awards and a strong customer following. My customers know how much I enjoy working directly with them to achieve their system goals. I have even met some of them in person at trade shows and in online user forums. I continue to push the limits in both sonic performance and how my customers experience what I deem as a labour of love. I have been working tirelessly on a refreshing product platform that employs a modular one-box approach as well as a patent-pending power supply implementation that transcends what I have achieved with our previous multiple-box battery power designs. I decided that this evolution calls for a new brand name, Vinnie Rossi, and the product platform is called LIO. I invite you to explore LIO as well as our new user community. You will find a dedicated forum, blog and the first of many videos that will follow. I also encourage you to sign up for our email newsletter to be the first to learn about exciting ideas in the works! I am very enthusiastic about leading an alternative to the 'multiple-boxes-that-become-obsolete' approach used by this industry for so long." 1) The death of obsolescence, the rebirth of lasting value. LIO is a modular system that gives you the ability to add features and upgrades at any time. It is designed for long-term ownership with the ability to easily configure it for your current and future needs. 2) Absolutely no noise. LIO includes an all-new patent-pending power supply design that completely isolates all audio circuitry from the AC mains power at all times. You don’t need expensive power filters, power cords or conditioners to achieve ultimate in musical resolution. LIO’s power supply is superior to even our own industry-leading battery supply! 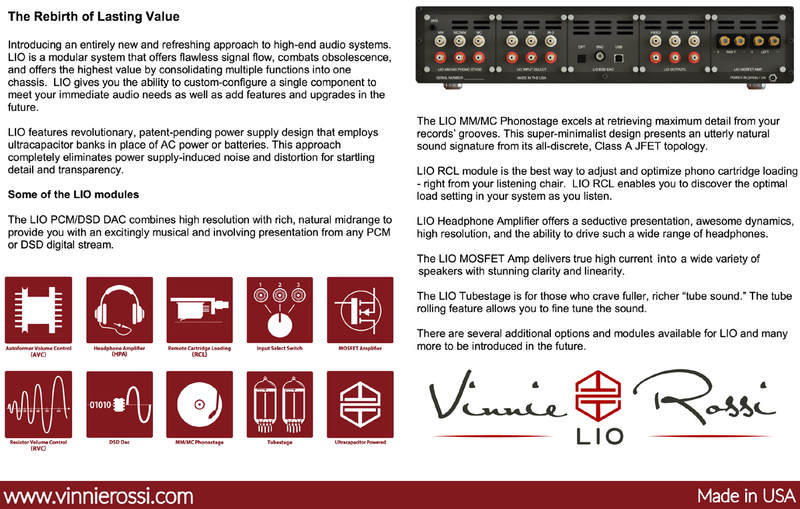 3/ Unlike conventional high-end audio components where multiple boxes are connected to each other by costly noise-and-distortion-inducing interconnect cables, LIO offers a modular approach that offers flawless signal flow, combats planned obsolescence and offers the highest value by consolidating multiple functions into one chassis and power supply. Compare the cost of a well-configured LIO with the cost of similar ultra high-end performance separate components. LIO will cost you hundreds, even thousands less and will never become obsolete! With LIO you can configure a system that perfectly combines all of your current needs into one chassis. When you are ready to add functionality or upgrade to new technology, simply add and/or change circuit cards. LIO is 100% user updatable via plug in modules, no soldering or special electronics knowledge required. You never have to take a big loss on a used component sale to maintain the state of the art. Features: Available modules include MM/MC phono with remote cartridge loading option; a 45wpc Mosfet power amp; a headphone amp; a PCM/DSD DAC; a tube line stage; and more. There is a clean and intuitive user interface with a front panel display and mode select to view operational data like volume level, input source, DAC sample rate, phono-stage loading and display on/off. A full-function remote control is included and there is a Bluetooth smart-phone/tablet interface for full control via Android and iOS devices. Add an easy-to-remove sliding top plate for quick access to internal modules; dedicated super-low noise linear power regulation and isolation between modules; a small external AC/DC power adapter to keep any AC noise away from your music; and user-replaceable front, side and top plates to allow for the customization of the product aesthetics at any time. 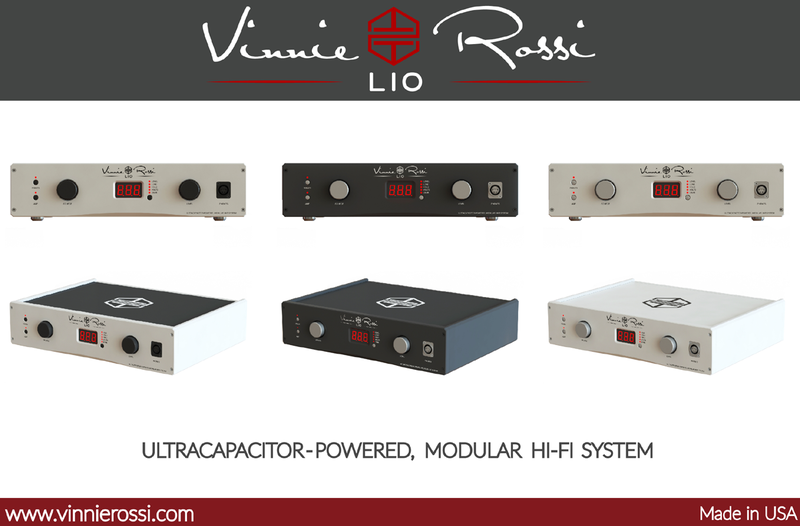 LIO’s internal power supply uses Vinnie Rossi’s all-new revolutionary and patent-pending PURE DC-4-EVR technology that employs ultracapacitor banks in lieu of conventional AC power or batteries. The ultracapacitor banks take turns feeding the audio circuits and charging. The audio circuitry is never connected to the charging circuit and is 100% isolated from the AC mains at all times. This approach provides dramatic performance and durability advantages over every other power supply technology whether AC or battery. Compared to traditional AC powered components, LIO’s audio circuits are completely isolated from the AC mains. No matter how grungy, noisy and inconsistent the AC coming out of your wall happens to be, you will never hear anything less than utterly quiet, perfectly detailed sound. Zero AC hum and noise create a completely black background from which the subtlest musical information emerges with perfect clarity. There is no power supply-generated magnetic and EMI radiation that could pollute other components in your system. There is no need for expensive power conditioners, 'audiophile' power cords or dedicated power lines. There is instead a super high-current supply as there is no AC-DC conversion, no transformers that choke current, no bridge rectifiers that add resistance and noise. You will enjoy greater dynamics with tight precise bass response along with more open and extended treble. Compared to battery-powered components, there is super-fast charging time. Life span is rated at 500’000 cycles compared to 2’000 cycles for the best Lithium battery topologies to provide the user with a lifetime of use. These ultracaps do not need replacing like batteries. Their higher current output runs LIO’s Mosfet amplifier. It is environmentally friendly with no heavy metals or disposal issues. It is maintenance free. It is the cleanest, high-current DC power supply yet. It has ultra-low internal resistance of <0.003 ohms per cell, delivering higher DC current than any other storage device. And, there are no memory effects. Modules. The LIO DSD DAC combines high resolution with a rich natural midrange to provide you with an excitingly musical and involving presentation from any PCM or DSD digital stream. Now you can take advantage of the latest ultra-high resolution DSD music files that combine the musicality of vinyl with the convenience of digital. It converts both PCM and DSD digital audio streams to pristine analog with bit-perfect playback at sampling rates from 44.1kHz to 384kHz (16, 24 or 32-bit compatible). Sample rates are viewable from the front panel display. This DAC is a dual-mono design with independent converter chips per channel. USB is asynchronous and integer-mode ready with the LIO app. Onboard reclocking circuitry reduces jitter considerably. Galvanic isolation appears on the oscillator and reclocking circuitry. Ultra-low noise linear voltage regulators are used throughout. Connectivity is USB, BNC and Toslink. The swappable daughter board contains the D/A converter chips and analog output stage so you can easily upgrade performance as new technologies become available for total future proofing! LIO DSD Dac specifications are 2.0Vrms output voltage; <100Ω output impedance; >100dB SNR; 16/24/32-bit signal depth; 44.1–384kHz PCM; DSD128 via DoP. LIO MM/MC phono stage: Following our design philosophy that less is more, it excels at retrieving maximum detail from your records’ grooves by means of fewer parts. This super-minimalist design presents an utterly natural sound signature from its all-discrete Class A Jfet topology that employs zero feedback for its gain and RIAA stages. We use only premium parts throughout with short signal paths so you will experience deeper musical involvement when spinning your favorite LPs. We use a Belleson super regulator module for an ultra-low noise power feed and offer 2 x MC and 1 x MM inputs on Cardas Rhodium-plated RCA jacks with an optional RCL remote cartridge loading module. Specifications for MM are 40dB gain with 47kΩ loading; and 60dB gain for MC with 16 x load setting from 26-400Ω. Output impedance is <100Ω. RIAA is based on a passive filter between two discrete class A JFet stages. The voltage gain stages are class A Jfet without feedback. To get the absolute best performance from your phono cartridge, it is critical to fine-tune the input impedance loading. The easiest most effective way to do that is with the LIO Remote Cartridge Loading (RCL) module that allows you to adjust cartridge loading from your listening chair. Optimize your phono system sound by ear, on the fly while you listen. This gives you 225 x individual settings for high precision cartridge loading with a load range from 5-5’000Ω and two loading presets to quickly swap values for comparison. LIO tube stage: This is your go-to option if you crave the fuller richer presentation of tubes. If you are a tube aficionado, you will love that you can change tubes at will to achieve the exact sound you’re after. Our tube stage is unique. It offers the lowest noise floor and the highest tube life thanks to our patent-pending Pure DC-4-EVR power supply. It uses 2 x E88CC dual triodes, one per channel. Gain is switchable between 0/12dB to optimize volume control range for your system. The operational mode is class A auto bias with auto mute during warm-up. There are no DC/DC converters, just clean linear regulation. Stock tubes are JJ E88CC. Rolling options include 6922/E88CC, 6DJ8/ECC88, 7308/E188CC, 7DJ8/PCC88, 6N23, 6H23, 6N11 and 6GM8. Output impedance is <500Ω. Frequency response is 10Hz–100kHz ±0.5dB. LIO headphone amplifier: It is rare to find a headphone amplifier that offers a seductive presentation, awesome dynamics, high resolution and the ability to drive such a wide range of headphones. The LIO HPA is that rare find that will keep you listening in your private world and enjoying every minute. It has single-ended and balanced outputs with a low <1Ω output impedance. Load impedance may vary from 8-600Ω. A hi/lo gain jumper optimizes volume control range. Output power is 1 and 2wpc for SE/BAL into 32Ω respectively. Frequency response is 5Hz–50kHz ±1dB. LIO Mosfet amp: This delivers a 2Ω-stable 45 watts per channel to drive a wide variety of speakers with stunning clarity and linearity. Ideal for the listener who favours quality over quantity, the LIO Mosfet amp is fast on its feet and deeply musical. It conveys the true emotion from your recordings even at lower listening levels that few amplifiers can rival. One listen and you will be hooked. The class AB output stage delivers 25/45/65wpc into 8/4/2Ω respectively, is fed directly from LIO’s high-current ultra capacitor power supply and outputs via Cardas Rhodium-plated binding posts. LIO resistor volume control (RVC): This is a highly transparent stepped attenuator that offers discrete 1dB steps closely matched between channels. With RVC you will be able to get exactly the right volume level with perfect channel balance and imaging. Use LIO RVC on its own as a passive volume control or follow it with the LIO tube stage to make a premium active line stage. Attenuation range spans -63dB to unity gain in 1dB increments with full dual-mono switching to allow for 1dB-stepped L/R balance with no additional circuitry from the remote handset or the tablet/phone interface. Attenuation resistors are premium Vishay/Dale resistors. LIO autoformer volume control (AVC): This is a premium volume control option as an alternative to the LIO RVC or RVC + tube stage combo as it takes the place of the LIO tube stage module. The heart of this module is the amazing top of-the-line autoformer by Dave Slagle. It is 100% passive and sonically transparent, with the entire signal path consisting of only pure magnet wire and high-quality switching elements made by Pickering of England. Full remote control of volume up and down and right/left balance plus mute function. Notable is the small 1dB step size from -54dB to +7dB unheard of for an autoformer or transformer volume control. Remote control is via the LIO handset or tablet/phone app. LIO input select: This module is the perfect answer if you have several legacy analog sources in your system. Add 3 sets of analog inputs,with input switching controlled via the front panel, remote handset or LIO Android or iOS App. Socketry is on Cardas Rhodium-plated RCA jacks. For more details, Vinnie had this: "I am still finalizing pricing. I can ballpark it for you now and say that the price range, depending on configuration, will probably be in the $2'500-6'500 range. I have been working on this with John Chapman of Bent Audio for the past few months. He's been hard at work designing the custom firmware for the system, the PCB layout, resistor volume control and autoformer volume control design, user interface, get involved in prototype testing and more. We've both been red-lining on this for the past two months. I have really enjoyed working with him for years now. We really went to town bouncing ideas back n' forth about doing a modular system many months ago when I brought it up to him. I told him that I was playing with ultracap banks over the last year or so. I knew he'd be perfect for the job to write the firmware to monitor and switch the ultracap banks precisely to pull this off. He was very excited about the idea of PURE-DC-4EVER (he came up with that name in an email just as a funny way to call it but I told him it was the perfect name for it). John was also clearly the guy for designing the volume control(s), input select, the clean and simple display on the front panel and an awesome smart phone/tablet app that he and his son have been working on this summer. It's very slick!" To wrap up, if you weren't hip to ultracapacitors, here's a manufacturer's take on them who makes such parts: "Ioxus Inc., with the only fully integrated ultracapacitor design and manufacturing facility in North America, maintains the highest standards and delivers the most flexible problem-solving methods for storing and delivering power. We use a propriety electrode design to deliver the highest power density available. Ioxus ultracapacitors, also known as supercapacitors or double-layer capacitors, are optimized for the highest performance with the lowest resistance possible. Although they have been around for decades, the unique benefits of our designs as compared to traditional capacitors are numerous. They create more power with low resistance, remain impervious to the effects of temperature and use less energy. Lightweight and designed to last, they will drastically increase the system peak power when combined with high-energy sources to optimize your product. They will prolong the lifespan of other energy sources such as batteries; or they can act as a standalone energy source. 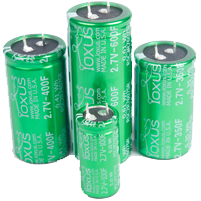 Having no detrimental effects on the environment, Ioxus ultracapacitors are the epitome of green technology. "Our cells weigh only a fifth of a comparable battery but are capable of more than one million cycles. An ultracapacitor’s energy storage mechanism is a highly reversible process, relying on the movement of ions within an electrolyte. However, it does not make or break chemical bonds as a battery does, enabling very fast responses with the capability to deliver those responses hundreds of thousands of cycles with a minimal change in performance. They are able to perform in a wide range of operating temperatures, from -40 to +65° Celsius. One of the best things about our ultracapacitors is that they are completely maintenance free, with a long shelf life at temperatures up to 70° Celsius. These unique characteristics enable the design engineer to improve the energy efficiency for demanding power applications. Ultracapacitors allow for the replacement of existing energy storage systems but can also be paired with additional energy storage devices for more highly efficient systems. They are used to extend the charge time on hand-held electronics and to power hybrid vehicles, wind farms, material handling equipment and other green energy technologies which are enormously important today."